When spooked, a snipe bolts from its hiding place at a great speed and is gone. Consequently, shooting a flying snipe presents a considerable challenge. So much so, that those who became good at it were called snipers — a term that was adopted by the military for a marksman. In late summer, I spooked a snipe, but it vanished in a blur before I could shoot its picture. 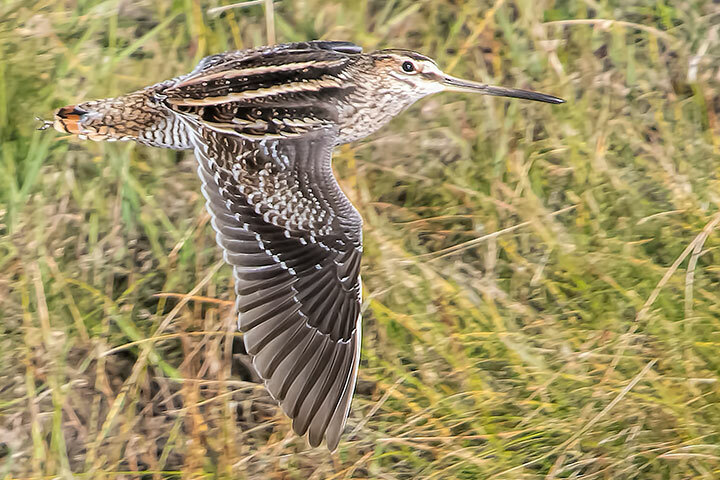 Yesterday, a snipe erupted along my path; I shot it. I now qualify as a sniper. Interesting info, and clear photo, you sniper you! I can attest to how fast they are! I released a snipe last week that had been a patient at the Calgary Wildlife Rehabilitation Society. When I opened his carrier, he walked delicately out onto the tailgate of the truck, and then exploded into the air. So much for a flight shot!